The rust-red carcass of Calypso, the boat that carried Jacques Cousteau on 30 years of aquatic exploration, lies on the dock at Concarneau in Brittany. The hull is a rib of beams and the wheelhouse, craned off, sits next to it on the tarmac. The victim of a Cousteau family squabble, this is an obscure graveyard for a boat that represented the spirit of oceanic adventure for 40 years, from which the explorer and his crew pioneered scuba diving, built underwater bases and revealed briny wonderlands to an awestruck public. The good news is that just a couple of hundred metres away, her successor is lashed to the dock. Cousteau was certainly an inspiration for the 76.6 metre motor yacht Yersin, but so was Tintin, Prince Albert I of Monaco – “the sailing prince” – and, most significant but least famous, the 19th century physician and bacteriologist Alexandre Yersin. Born in 1863, Yersin left Louis Pasteur’s Paris laboratory in 1890 to voyage through Southeast Asia, carrying out groundbreaking work on the bubonic plague and other diseases – research that would save many lives. 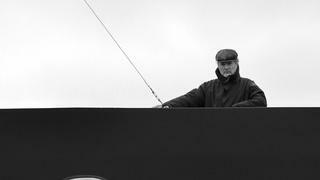 François Fiat, the French businessman who conceived and owns the boat, distilled these diverse influences into three aims: adventure (Yersin has a world-roaming range); science (she’s designed with serious scientific kit and has been awarded the Cleanship class notation that means she will minimally impact the ecosystems she visits); and education (to teach children about the natural world). This is not just another explorer, there is a human project attached to the boat. This ethos, the so-called ASE project, was a hard sell before Yersin was there to exemplify it. Fiat’s requirements for Yersin were so specific that he designed her largely himself, in collaboration with his captain, Jean Dumarais, chief engineer Yordan Hristov, designer Pierre J Kubis, and of course the yard. Fiat knew yacht builders – he once owned the 52 metre BenettiLatinou (now named Latitude) – but world-roaming toughness rather than luxury was his priority, so he took his design to commercial yards. Some were uninterested, others were intent only in selling him the kind of boats they already produced. Only Piriou, based in Brittany, really listened. It certainly knew how to build serious ships – military boats, patrol vessels and deep-sea fishers are its bread and butter. “We knew technically they could achieve it,” says captain Dumarais. “They have boats on the roaring 60s, long liners working on six-hour shifts. And they stay there for 90 days, non-stop.” During the 36-month build Fiat visited every two weeks and towards the end he essentially lived in Concarneau. The decision to undertake his first leisure craft was a difficult one for Pascal Piriou, CEO of the yard. “Failure would have been deadly for us,” he says of the possibility that the owner would not accept the finished vessel. And they didn’t need the work. “It was a new strategic move,” says Piriou. “There are not so many types of boat you can still build in Europe – really just yachts and military boats. For these, cost is important but not the main thing. Skill and the European touch is something important.” Now they have quite a prototype, built to the ultra-safe Solas passenger ship code. The technology on this boat is her greatest luxury. The starkest example of this is Fiat’s willingness to sacrifice guest spaces for technical spaces – the engine room is so sprawling, each piece of equipment given so much space (for accessibility), that it could be mistaken for a modern art gallery. And this certainly is artistry – innovative, tailored tech that weaves elements from automotive design, cruise ships and other industries into an ultra-resilient, ultra-green system. Keeping an eye on it all is a 1,200-point monitoring system. Yersin’s diesel electric propulsion spreads power production over six generators that can be brought online, one by one, according to demand. They burn only the fuel they need so they’re green and offer serious range. Two azipods to stern are complemented by a pump jet forward that allows an extraordinary degree of manoeuvrability: coming into her side-on berth at Concarneau, her turn and glide to starboard are eerily smooth. 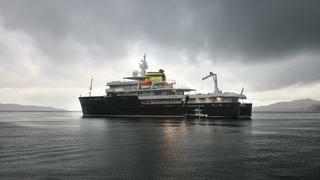 This tech is green as well as lean: at 11 knots, Yersin consumes 360 litres of diesel an hour, half what she would with diesel engines, and at 9 knots this drops to 180 litres an hour. The catalytic exhaust filters 99.8 per cent of harmful particles, while a thorough black and grey water system ends with a UV filter that “zaps” any last bacteria. The resulting water is stored in tanks and is so clean that it can be used to wash down the decks. Outside, the hull’s silicone antifouling paint does not contain harmful TBTs, while dynamic positioning allows Yersin to stop in areas where dropping anchor would damage coral. All the wood on board is sustainable and decks are Bolidt artificial teak – greener, cooler, lighter and hardier than the real thing. Eco credentials have benefits for Yersin’s adventurous ambitions. “Last summer we did some dives with Prince Albert II in a protected marine park near Corsica,” says Fiat. There is certainly a lot of world open to Yersin. “We thought we would have a 12,000nm range at an economical speed,” says Dumarais. “In fact she has 15,000nm.” Yersin can spend 50 days at sea with 40 crew and no assistance – and 10 days without discharging waste. 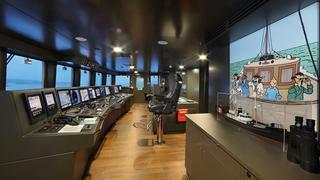 The bridge features every piece of explorer gadgetry, from sounders that scan 1km forward – for ice navigation – to night-vision cameras for spotting wildlife, high-definition day-time cameras, a radar specifically for river navigation and an electronic chart display that works like a giant iPhone. The Arctic and the hottest parts of the Pacific are both on their hit list. 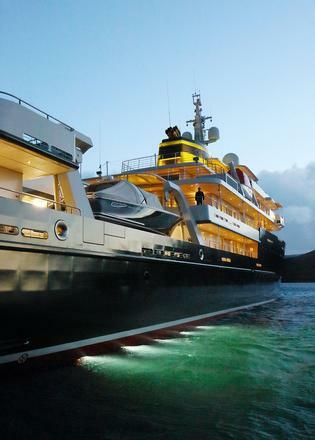 The hull is Ice Class and built for the realities of life on the (very) high seas. A broken pump or engine can be moved through a door into the workshop, also accessed from a spare part, electrical and welding shop. If the equipment is kaput, Yersin’s crane can lift it out of the boat via a hatch built into the side of the workshop. The sophisticated air-con system works in climates of -20C to 50C, with uniform air pressure and a heat exchange to treat icy incoming air. 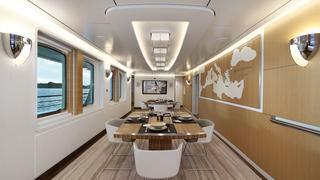 The galley is of professional proportions, with stations for whipping up different delicacies and stores, fridges, freezers and a rubbish system massive enough for a long-range voyage. So, crucially, are the lower deck crew cabins. These are twin rooms of an extraordinary size – they look like guest cabins and have the same entertainment options and internet – with plenty of storage, en suite shower rooms and a dividing curtain that is useful when room-mates are working different shifts. Crew can work out in their own gym or relax in their comfortable mess. There is also a proper medical room, complete with a camera link-up to a hospital in Toulouse. But Yersin is built not just for getting to extraordinary places, but to make the most of them once there. Aft on the lower deck, a platform can be lowered into the sea to retrieve divers from the water and just inside is a compressor and dive store. On a boat that so ambitiously pursues its three defined goals, flexibility makes sense. 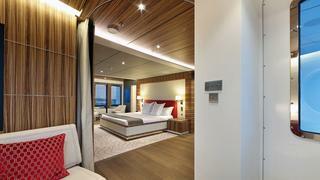 Perhaps the best example is the polyvalent room on the main deck. This can be used as a laboratory – with sinks and other necessary kit plus a TV with internet and satellite link-up. But it could also be a video conference room or a classroom. A sliding partition also allows it to be used as two separate spaces at the same time. 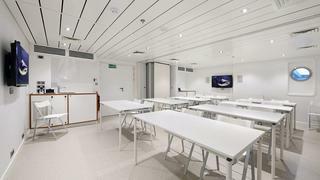 There’s more for scientists on the main deck, with a lab that includes an office and taps for freshwater and seawater. It is forward so that a scientist studying seawater can get a pure sample, not one from the stern platform when the boat has already passed over. If an individual or group wants to make a voyage they apply to Yersin’s board, which has seven expert members. Projects could range from universities researching new species to production companies making nature documentaries, as long as it chimes with the ASE objectives. Out on the decks the exploration kit is stunning. 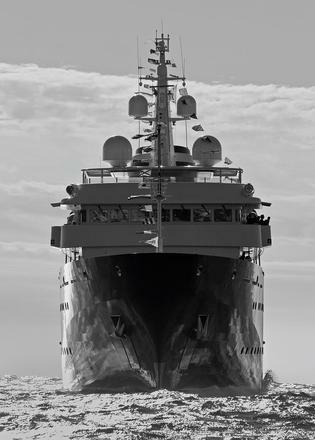 Yersin’s aft deck can be used as a touch and go helipad or carry a seaplane – lifted from the water by a crane – and she carries fuel to extend the range of these tools. 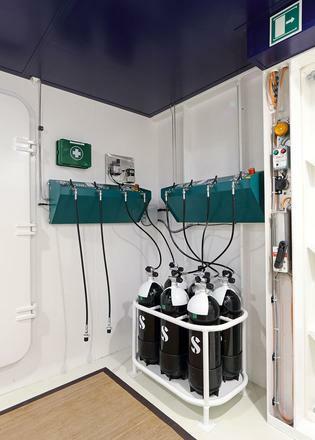 The space also has power points for a deep sea diver to store a mini-sub or a decompression chamber. The permanent kit comprises a Can-Am quad bike, two military style (bulletproof) Zodiac Hurricanes, a Munson landing craft and a sleek, 11 metre Wajer Osprey, all customised. If things go to plan, however, guests will get to enjoy their cabins, simply decorated but offering superyacht quality and comfort, with colour-changing “luminotherapy” showers, anti-steam mirrors and marshmallow-soft beds. The full-beam master suite, forward on the upper deck, has a chic white Corian bathroom, a kitchenette, an office and its own deck area. Décor in the guest areas was restricted by Solas regulations but you’d hardly know it. 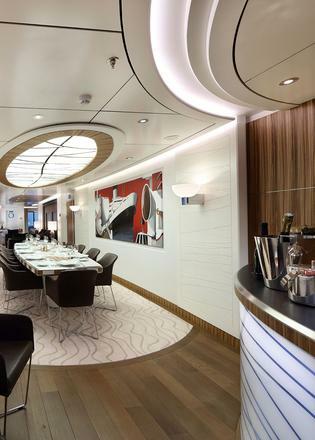 “The interiors contrast oak and Zebrano veneers, lacquered ceilings, aged oak flooring with wool carpets, stainless steel and leather stripes,” says Kubis, with the aim of “serene and soothing atmospheres, conducive to long sailing”. There’s also a broad sundeck with a spa pool, a pretty bar in the main deck dining area and, on the lower deck, there’s a spectacular spa with a gym, hammam, hairdresser, massage room and spa pool. 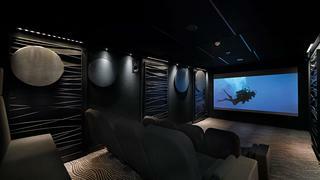 Then there’s the upper-deck cinema, built with recording studio quality sound. The choices of artwork reflect Fiat’s inspirations, from black and white photographs of famous ships to a portrait of Alexandre Yersin and even a Tintin print in the bridge. But perhaps the most illuminating is a glass sculpture in the main deck saloon. It is cut to create an optical illusion – from one side it shows the face of Prince Albert I but, as you walk around it, this transforms into Prince Albert II, a staunch supporter of Yersin’s project, which draws on his own family’s history. His great-great grandfather, Albert I, inaugurated Monaco’s Oceanographic Museum in 1910 and Cousteau was director from 1957 until 1988. Like the ship herself, the artwork is about the revival of a great legacy.